Native American Symbols, like the Dancer symbol, can vary in meaning from one tribe to another and across the culture groups of North America. Discover facts and information about the meanings of secret and mysterious symbols used by Native American Indians in our List of Symbols including the Dancer symbol. 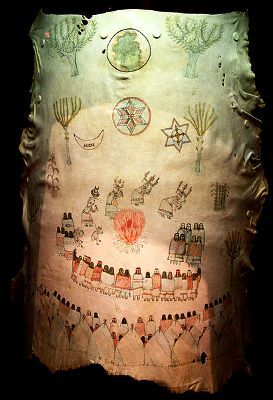 Native American Indians were a deeply spiritual people and they communicated their history, thoughts, ideas and dreams from generation to generation through Symbols and Signs such as the Dancer symbol. Native American symbols are geometric portrayals of celestial bodies, natural phenomena and animal designs. The meaning of the Dancer symbol was to signify a celebration or ritual dance, which often had religious symbolism amongst the Native American Indian tribes. Famous Native American dances include the Buffalo dance, Green Corn Ceremony, Hoop Dance, Scalp Dance, Rainmaking or Sun Dance and the Turkey dance. These ceremonies held a very important place in the culture and religion of the Native Indians and the dancer signified that such a ritual had taken place. 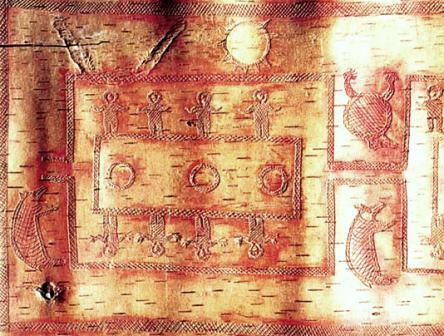 The picture below was created by a member of the Objiwe tribe in 1875 that illustrates one of their ceremonial dances. Their religion was dominated by rituals and belief in a spiritual connection with nature and these beliefs were reflected in the various symbols they used such as the Dancer symbol. Dancer. Discover the vast selection of pictures which relate to the History of Native Americans and illustrate many symbols used by American Indians. 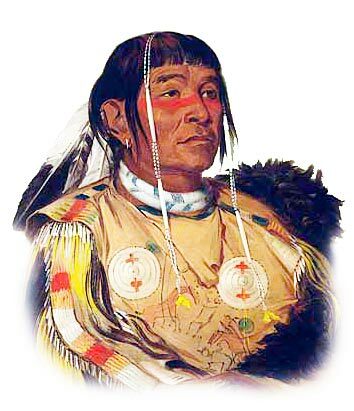 The pictures show the clothing, war paint, weapons and decorations of various Native Indian tribes that can be used as a really useful educational history resource for kids and children of all ages. We have included pictures and videos to accompany the main topic of this section - Dancer. The videos enable fast access to the images, paintings and pictures together with information and many historical facts. All of the articles and pages can be accessed via the Native Indian Tribes Index - a great educational resource for kids.